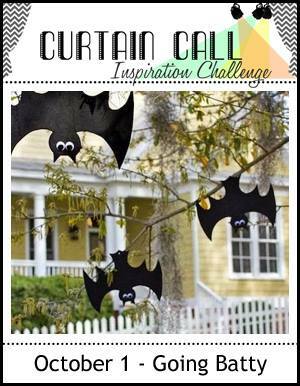 In My Creative Opinion: Curtain Call Inspiration Challenge - Going Batty! I almost feel guilty and how easy this card was to put together! I picked up the Recollections Black & Gold 6 x 6 paper pad last week at Michael's and this paper was perfect. I tried to think of more interesting or creative ways to be inspired but nope, nothing came. At least now I know that I used some of the paper rather than just hoarding in like I usually do--ha ha ha! I die cut in the panel with my stitched rectangles and adhered it to my black base. Then I added a cute Reverse Confetti Spooky Sentiment sentiment to the front popped up on foam. The hardest part of this card--was getting a decent photo. Hope that you play along with us this challenge. Well you nailed the hardest part, because your photo is perfect - as is your card! Okay, I'm gonna say it ... I'm batty for it! This is so much fun. I love the elegant feel of this. this card is SO Awesome..
Oh, this is fabulous, Tracey! I love it with the gold! 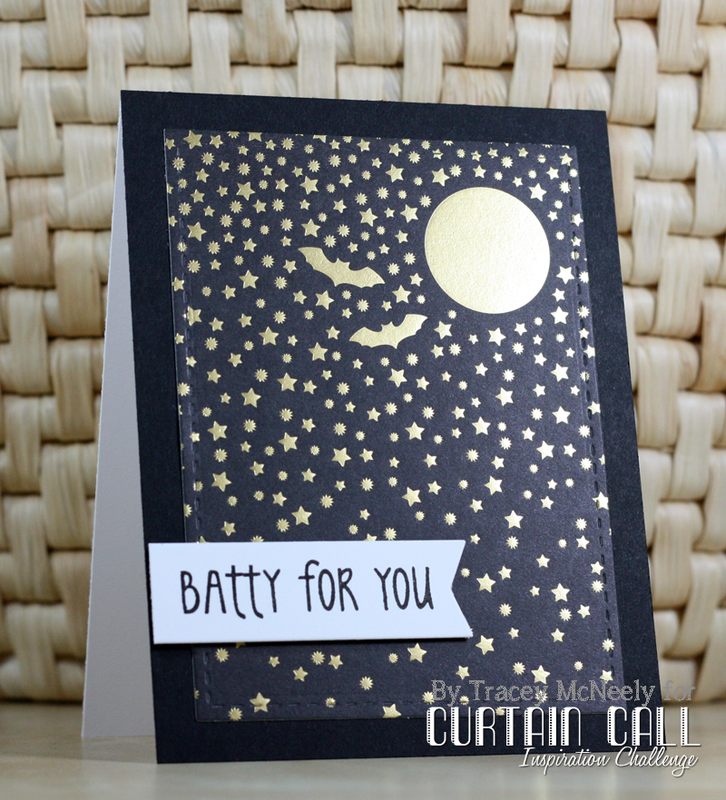 Super cute Batty creation, Tracey! Love the black & gold! wow! love the foil look! Love this midnight, batty scene! Easy is good, don't feel guilty! Ohhhhhhhhh I love love love this!!!!!!!!!!!! Totally worth driving to Michaels for finds like this gorgeous paper! ;) Nothing wrong with letting it do the heavy lifting. It makes for such an awesome card! Wow, awesome paper! And your photo looks great. It's wonderful to find something that helps to create an easy design--love it! And here I thought you stamped and embossed all those stars. ;) Perfect paper and sentiment for the challenge, Tracey. This is awesome! I had to chuckle when I saw that it was pattern paper. I think you most definitely can still take the credit for a beautifully made card. Love it. I love the simplicity of this card! The 2 bats are so cute surrounded by all those stars and the puny sentiment is perfect! You nailed it! Those are the best kind of cards! So perfect! Love that paper to bits and pieces! Amazing card Tracey. Love that paper. So elegant. This card looks like it took hours and hours. I'd stick to that story. Love all the black and gold. Oh my!! Crushing over and smitten by your gold star-and-bat studded moonlit sky! Wow...soooo classy!